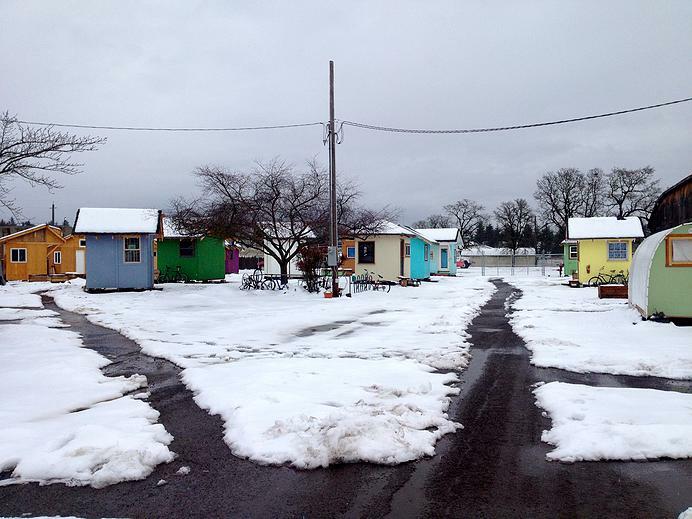 An increasingly effective alternative to group shelters is the personal shelter village model. These are not 'tiny houses,' but rather insulated and lockable hard-wall structures designed for sleeping, reading, privacy, personal safety and as a secure place to store belongings while working or seeking work. Personal shelters do not contain plumbing or electrical services. It may be helpful to picture a single-room occupancy (SRO) model, like the traditional YMCA common to most U.S. cities in the 20th century. In this case, those single rooms function as detached bedrooms, in what has been described as scattered-site multifamily housing, or a scattered-site SRO. Relative costs. The costs of constructing and staffing a group shelter or YMCA/SRO facility can run into millions of dollars; personal shelters, by contrast, can be constructed for as little as $500 each, but in colder climates costs could run from $750 to $2,000, depending on square footage and accessible or other features. In many cases these personal shelters are grouped together into small villages or courtyards—much like a small RV park—with common shower and bathroom facilities, meeting space and a food storage and preparation area. Residents pay a modest rental fee that is matched by local private donations to cover water, sanitation, electricity and even internet services. Typical resident costs for Opportunity Village Eugene are $3/person per day, with residents sharing in that cost. This low cost allows residents to begin saving for move-in costs required to transition back into the housing market. The day-to-day operation, maintenance and security of each village are the responsibility of the residents. It is in their interest to maintain internal peace and security—as well as good neighbor relations—to support a healthy living environment and to safeguard the village's existence. In this way, formerly homeless residents can use and develop habits and skills essential to employment and independence with peer support. This model also meets some of the criteria specified in HUD's Continuum of Care Model, namely the Transitional Housing and Safe Haven features. 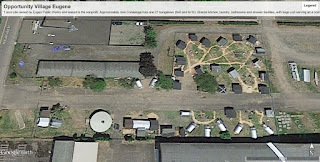 The models BASC members wish to follow range from the Eugene Safe Spots Program, run by Community Supported Shelters of Eugene, and Opportunity Village Eugene. Representatives of both programs have been extremely generous, sharing their time and the resources and strategies they've developed over the past several years. While the personal shelter village model seems new to Idaho, it is our hope that a pilot project based on the successes of Opportunity Village and the Eugene Safe Spots programs has the potential to meet a well-documented need, and complement the work of local homeless programs and services. If local leadership and the community are willing to take a chance, everyone involved would work to justify that confidence. One size doesn't fit all, and sometimes it takes a village. Boise can do similarly. We, the people of Boise, including the poor, the dispossessed, the transient citizens of Cooper's Court, can aspire to create and build a better community. Low cost, safe, secure shelter for every human being is a basic human need. Together, we can make it so. BASC is one approach of many, diverse ways of helping by local government, social services, individuals, and more.